They're among the glimmering jewels of the bug world. They're also among the most successful, having survived in much the same form for over 300 million years. Long past the glory days when these insect glitterati had wingspans like crows, they still dazzle us with their aerobatics. Able to hover motionless, and then suddenly dart in any direction in pursuit of insect prey, dragonflies have been dubbed "mosquito hawks." Even more hawk-like are their spectacular, but little known, migrations. Species native to Canada, such as common green darners and wandering gliders, engage in long-distance flights that involve many thousands of individuals. Despite their strengths, dragonflies cannot easily cope with the loss of their habitats to our ever-encroaching developments. They spend most of their lives underwater as nymphs. Without the wetlands and fast-flowing streams in which they develop from eggs into adults, the insects we see flashing over meadows and marshes would vanish. Their survival depends on our efforts to conserve their habitats. We can also help by building ponds with their particular needs in mind.Find a partially shaded, level site. Dig a hole at least 3 x 3 m across with a gently sloping, terraced bottom ranging from 5 to 70 cm deep. Remove any stones or other sharp objects and cover the bottom with a 5-cm-deep layer of sand, old carpets, or other padding material. Lay down a liner of 45-mil EPDM material or butyl rubber extending 30 cm over the border. Weigh down the edge of the liner with rocks and cover the entire bottom with soil. Fill the pond with tap water. Let it stand for two days before adding plants if your water is chlorinated. Select a variety of native plants that meet the needs of dragonfly young. (Keep in mind that they start out as eggs attached to submergent and emergent vegetation, then hatch into nymphs that also live among aquatic plants.) Suitable submergent plants include waterweeds, eelgrasses, pondweeds, and water celery. Reeds, sedges, rushes, cattails, arrowheads, blue flags, water lilies, marsh marigold, water plantain, swamp milkweed, and water milfoil are recommended emergent plants. If you cannot find a local supplier of native pond plants, obtain permission to transplant stock from sites with abundant vegetation. Use a shovel to remove common plants in small clumps with soil surrounding their roots. Do not uproot entire bunches. Keep the plants damp and relocate them immediately. Push roots about 5 cm below the surface, firmly packing soil around them. They can also be planted in pots, and then submerged at varying depths in the pond to serve as egg-laying sites. Plant a lush perimeter of native grasses, meadowsweet, wild ginger, Canada lily, and cardinal flower around your pond. Place several stakes, about 1 m high and 2 m apart, alongside the pond as perches for resting dragonflies. Don't be too fastidious about cleaning. Freshen the water during dry spells or if it turns stagnant. Help make way for migrants that rely on watery spots by tackling any of the following habitat projects. Restore a ribbon of life: Revitalize the strip of moisture-loving trees, shrubs, and plants along a water body and boost an entire shoreline community. Adopt an urban waterfront: Reclaim a metropolitan shoreline by cleaning up garbage, preventing pollution, planting a vegetation buffer, and undertaking other habitat initiatives. Protect prairie potholes and streams: Promote shoreline-friendly cows and crops, grow a living fence row, and plant upland grasses to conserve some of Canada's richest aquatic habitat. 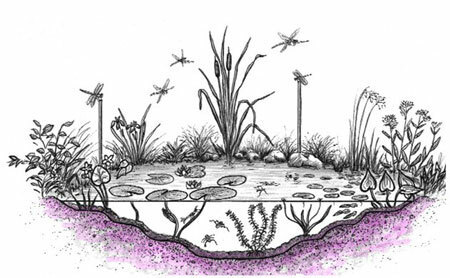 Work wonders for wetlands: Mount a cleanup campaign, restore wetland flora, create a miniature marsh in your schoolyard, and implement other strategies to conserve soggy spaces for aquatic migrants. Be a vernal pool lifeguard: Help save the temporary wetlands required by many amphibian migrants to complete their life cycles. Build an amphibian pond: Provide a permanent body of water to accommodate toads, salamanders, frogs, and other migrants that breed in ponds. Provide toad abodes: Make toads feel at home in your schoolyard year-round by offering them shelters to spend the summer and hibernacula to while away the winter. Prevent pollution: Learn how your community contributes to water pollution, then monitor water quality and cut pollutants off at their source. Relieve the underwater housing crisis: Create escape cover and spawning sites for walleye and other migratory fish by building and installing submersible shelters. Restore an aquatic plant community: Reintroduce native aquatic plants by sowing seeds or transplanting vegetation from a donor site. Curb aquatic exotics: Root out purple loosestrife, muscle out zebra mussels, and resist other alien invaders now wreaking havoc on native species and ecosystems. Keep the waterfowl comeback on track: Advance the recovery of Canadian ducks by providing nesting cylinders for mallards, pintails, and teal and nesting boxes for mer-gansers, goldeneyes, and buffleheads. Lend wings to ospreys: Build nesting platforms for these noble fish-hawks to offset the loss of their natural breeding sites in tall trees and snags along shorelines. Accommodate colonial birds: Extend the life of a heron or cormorant rookery by replacing collapsed nesting trees with artificial structures. Keep loons afloat: Ease the impacts of shoreline developments and recreational activities on loons by participating in a biological survey and building floating nesting structures.